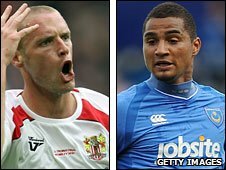 Relegated Portsmouth face a trip to League Two newcomers Stevenage in the first round of the Carling Cup. Portsmouth's south-coast neighbours Southampton face a home tie against fellow League One side Bournemouth. In the northern section, promoted Leeds host Lincoln, Stockport host Preston and Rochdale face Barnsley. The ties will be played in the week commencing 9 August, with Premier League clubs and Hull and Burnley entering in the later rounds. Burnley and Hull City, the highest placed of the clubs relegated from the Premier League, have a bye to round two along with Premier League clubs not involved in European competition. Nottingham Forest in one section and Notts County in another. How does that work? Holders Manchester United, who beat Aston Villa in last season's final, are among the clubs entering in round three. Bournemouth's clash against neighbours Southampton will be the sides' first competitive fixture since a two-legged League Cup meeting in 1987 and only their third meeting in 50 years. "The local interest will be huge. It's a really attractive game," Bournemouth boss Eddie Howe told BBC Radio Solent. "Everyone thinks Southampton will be very strong, so the match will give us a useful yardstick." Wednesday's draw, coming a day before the announcement of the 2010/11 Premier and Football League fixtures, was divided into two sections and then split between seeded and unseeded teams - meaning Championship clubs could not face each other. Cardiff, who lost in the Championship play-off final, are drawn at home against Burton Albion while beaten play-off semi-finalists Nottingham Forest and Leicester face Bradford and Macclesfield respectively. Oxford United, who beat York City in the Conference play-off final, entertain Bristol Rovers. The Carling Cup final and two semi-final legs will be shown live on BBC television, with highlights of every game available on the BBC Sport website for UK users.